48" post for a permanent mount. Perfect for a small patio or apartment complex. Made from powder coated aluminum steel. < li>For use with natural gas. There are several options available from AEI for mounting your new "A" series grill head depending on where it is being installed. This 48" post is a great choice for mounting your grill on a small patio or in an apartment complex since it doesn't take up much room. Since you chose a durable grill, you want a durable post like this one that is quality built powder coated aluminum steel. When a permanent mount that is compatible with a natural gas hook-up is needed for either the A30 or A40 grill head, this permanent post mount is an ideal choice. How many burners does this unit have? (I see two knobs, so I assume two.) How many BTUs per burner? Also, how many square inches is the cooking area? 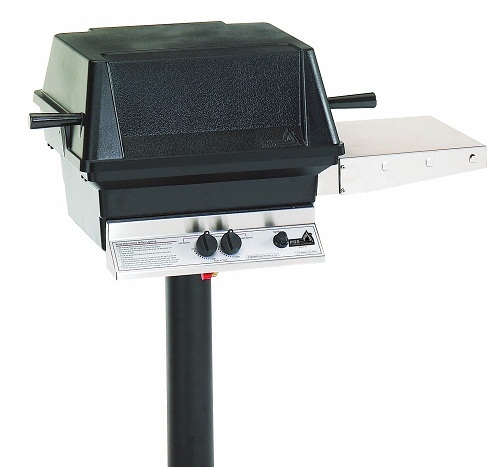 This item is actually a grill post and not a grill. It is for use with our A30NG grill heads or our A40NG grill heads. These grills produce 30,000 and 40,000 BTUs respectively. They each feature a single H style burner.